Yes, these are fermented apples. While making this recipe, I had the thought “they’re all going to think you’re crazy!” running through my head. So whether or not that’s true, I hope you’ll read on to discover to unique beauty of these Lacto-Fermented Cinnamon Apples. I began a new series on Fermented Foods last week with the introduction of my absolute favorite sauerkraut recipe with garlic, cumin, and celery salt. And if you haven’t read it yet, I go into even more detail on how and why fermented foods are so great for your GI in this post. Well, this recipe came about with my brain turning over ways to preserve the apples coming in our CSA. And though I’ve posted about canning here at Bare Root, I’m definitely still a novice. Not to mention, a little too lazy for water-bath canning. And having begun to lacto-ferment so many different things lately and noticing how well they keep (albeit while taking up valuable fridge space), I just had to give this a try. The flavors are very fall, while still carrying across the sour fermented taste. Jorge compared them to apples they’d cut up as kids and sprinkle with chile limon seasoning (minus the spicy). Like that stuff you could buy from the ice cream man. If you live in Arizona, you know what I’m talking about. You’ll definitely want to keep a closer eye on this than with the sauerkraut. It can go from sweet and slightly sour to sour and slight sweet in just a day. I’d recommend checking at 3 or 4 days. You’ll know if it’s getting there by how salty the water still is. When the salty taste dissipates to barely noticeable, you’ll find the apples are still pretty sweet with just a tiny bit of sourness. A slice off the top of the apple works perfect as a weight to keep the slices submerged (like pictured below.) It will just need to be composted or trashed once the apples are ready since it isn’t fully submerged during the process. Of course, you could also invest in weight specifically made for fermenting like these ones. But I found the apple slice worked really well and didn’t get moldy at all. My house is also kept in the low 70’s, which is a factor. If your house is 80F plus, you may want to get some weights since the process will go much faster. Enjoy these apple slices over a salad or right from the jar as an sweet afternoon snack. Combine crushed cinnamon (add to desired cinnamony-ness), lemon juice, zest, sea salt, and filtered water in a medium pot. Heat over medium heat until barely simmering and salt is dissolved. Remove from heat and cover to let steep and cool 30 minutes. Wash apples well with a fruit & veggie wash. Slice the tops off 2 of the apples and reserve for packing the jars (as pictured above). Quarter the apples and slice very thinly (I like to use the blade attachment on my food processor — saves a TON of time). 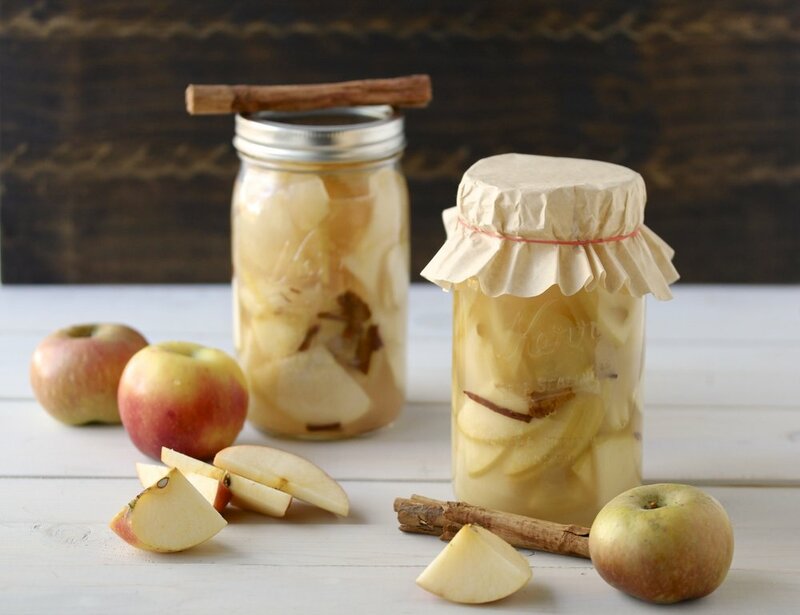 Pack sliced apples tightly into 2 quart jars, careful not to bruise them as you press down. Fill the jars with salty water, transferring cinnamon pieces and all. 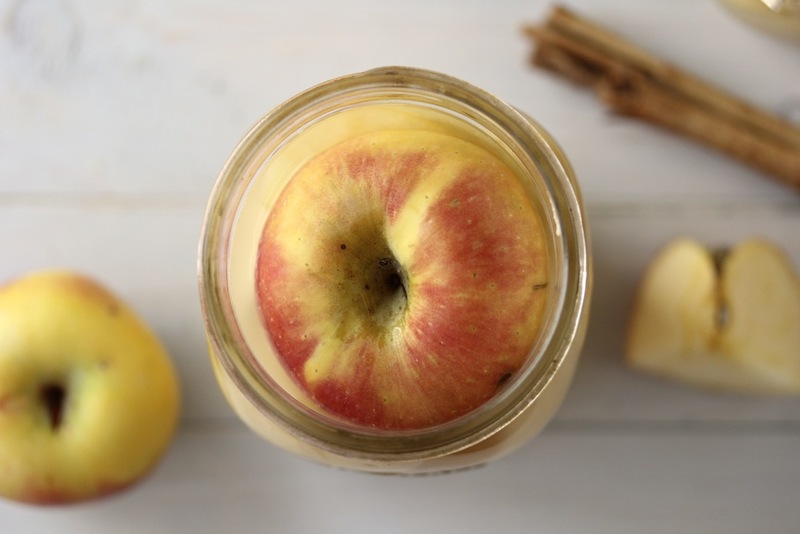 Place a reserved apple top in each other jars to submerge the slices in the liquid. Cover with coffee filters or cheesecloth. Leave at room temperature for 5-7 days, testing around 4 days to gauge how sour it is. The longer it’s left at room temperature, the more sour (and less sweet) it will be. The fermented apples will keep for 3-6 months in the refrigerator, as the cold temps will halt the fermentation process right where it’s at. I’ve just started tinkering with fermented foods recently and have been using the whey from my yogurt to ferment lemonade. Some fermented foods just don’t look or sound all that appetizing therefore I’m a bit skittish about trying them. This however looks delicious and can’t wait to try this! i just made some fermented raspberries and they turned out lovely!!! i love apples, too, so i will have to try these. Love that idea, going to try raspberries next. Thanks! anyone know if people who can’t tolerate apples because of FODMAP issues would be better able to tolerate fermented ones? Rebecca, my response is delayed but I have recently ventured into a low FODMAP diet so I now have a possible answer to your question! This article http://chriskresser.com/got-digestive-problems-take-it-easy-on-the-veggies from Chris Kresser talks about how fermenting foods before consuming makes them safer for consumption because in this instance, the fructose in the apples is (mostly) used up in the fermentation process. I have had success so far eating my normal sauerkraut with still seeing digestive improvements due to a low FODMAP diet. If you see this, I hope it helps! These sound really intriguing! I’ve been adding more and more fermented foods into my diet and I’ll add this into the mix next. Thanks!! Thanks, Candace! I hope you enjoy this recipe. It that 4 tablespoon of salt? why is that "lacto" fermented? Hi Glenda, if you read this post https://barerootgirl.com/the-blackboard/2013/10/10/gut-health-how-fermented-foods-can-ease-your-gi-discomfort, it discusses the lacto-fermentation process in more detail (also explaining why it’s called that). Hi Felicity, since I haven’t tried the recipe with ACV, I couldn’t say for sure. The lemon juice is purely for flavor balance, not to aid in the fermentation process. And most ACV have cultures of their own in them so my advice would be not to use it in any lacto-fermentation process, as it may compete with the good bacteria you are working to cultivate. Hi, thanks for the interesting sounding recipe – I’d like to give it a try. I do alot of veggie fermenting but I have little experience w/ fruit. I was wondering why you heat the brine? Hey Rachel! I heat the bring to bring out the flavors of the cinnamon and lemon so they can infuse quicker into the fruit when fermenting. I live in AZ and my house is pretty warm 6-8 months out of the year (too expensive to keep it cool). This makes my ferments shorter, sometimes only about 5 days. Especially with fruit that I want to stay a bit sweet. I know if you let it go longer than that, the flavors usually have a better chance of coming out on their own so you do have the option of not heating it. Hi – not sure what I did wrong here. The apples are super, super salty! 🙁 I tasted them throughout the fermenting process as I thought the flavor might improve over time. Would this recipe still work with MUCH less salt, or is the 4 Tbsp needed for this process? Hey Laura, I always use the ratio of 2-3 T. salt per quart of water for ALL my fermenting and it always works well. Sometimes it takes longer depending on the temp in the house. If it’s too salty, it’s probably just not done yet. I am new to fermenting, and I can see using salt for veggies, but for fruit? Not sure! Yours don’t taste salty when done? I cannot tolerate whey or lemon juice, so was considering using a probiotic capsule to do my apples. Maybe I’ll try both the salt, in one jar, and the probiotic capsule in another. Thank you! Hey Maria, it’s best to leave room for air to escape with more fermented foods. Otherwise internal pressure can build up within the jar. You can cover but you may want to open briefly to let gasses escape every couple of days.